A natural artistic talent for painting, a passion for flora and fauna and a professional career in creative cookery led Helen to her work in botanical illustration. 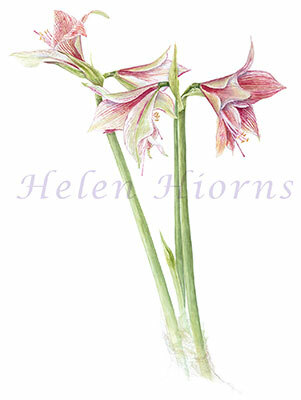 Having always had a passion for art, flora and fauna, Helen completed her diploma in botanical painting from The English Gardening School at The Chelsea Physic Garden in 2009. Soon after, she became a member of Amicus Botanicus and has exhibited with the group in London. Helen is also a member of The Bedgebury Florilegium which meets each month at the Pinetum in Kent to record the trees, flowers and cones. Working in her studio at home in Surrey, she aims to paint most days and continues to be captivated by observing nature in fine detail. In addition Helen has recently been featured in Surrey Life Magazine on their ‘Meet the Artist’ page. ‘Florabundance’ at Watts Contemporary Gallery, Compton, Surrey - an exhibition of paintings, drawings, and prints from contemporary British artists. ‘Enchanted Gardens’ at Godalming Museum - art works by present day botanical artists and complimentary works about Gertrude Jekyll.